It looks at first like a piece of a rough, greenish mat from a 1970s student flat. In fact it is a 5,000-year-old bag, a very rare survival in Ireland’s Neolithic archaeological record of an object of organic material. 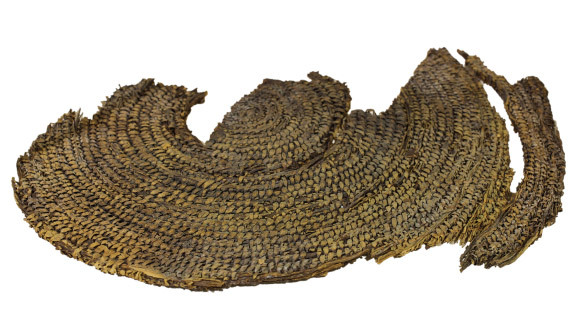 It was found in a bog in Twyford, Co. Westmeath, and was made by coiling long slivers of wood into spirals that were then bound together with lighter grass-like material. Next, the two sides were woven together along a seam, and handles of plaited straw were added. This would have made for a circular, purse-like bag, about 40cm in diameter, with a narrow opening at the top. It was probably dyed to give it a splash of colour. It offers a glimpse into the everyday life of early Irish farmers. Though we cannot know for sure, there is every chance that it was made and used by a woman. Similar bags have been found around the world: the technique goes back to the Middle East around 4800 BC and is still used by indige- nous cultures. In fact, the best way to get a sense of the Twyford bag is to look at a very similar but intact specimen from nineteenth-century Aboriginal Australia that is also in the National Museum of Ireland. The Twyford bag takes us back into the day-to-day world of Irish people in the fourth millennium BC. Most of what survives from this era is made of hard stone and tends to be associated with ritual, death and power; has the drama of violence and mystery; and is overwhelmingly male. To look at a simple bag that might have been purchased at an ethnic market in a modern city and imagine it in the hands of a Neolithic woman gathering plants or nuts is to be reminded that life, then as now, was dominated by ordinary things and tasks. What do we know of those ordinary lives? They were short by our standards: most people could not expect to live beyond their 30s. People were probably about the same height as Irish people were in the 1930s: the Neolithic male skeletons found at Annagh in Co. Limerick were about 170cm (5ft 7in) tall. Again from the Annagh skeletons we know they worked hard, but not quite as hard as their counterparts in mediaeval Ireland. They probably wore clothes of leather and woven textiles, such as flax. We know, too, that they increasingly lived together in relatively substantial settlements of wooden houses, lined with wattle and daub and with thatched roofs. Communities were settling down for the long haul. By the time this bag was made its owner probably lived in a society that had a sense of itself as being old.